Right now the last thing I want to do is cook. 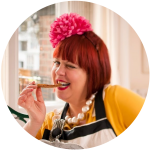 So my next few recipes will concentrate on no cook recipes. In this clammy heat, you want light foods, fresh, crunchy, salads, raw fish dishes such as ceviche and poké, which are quick pickled with lime and lemon. I’m also drinking ‘shrubs’, vinegar and fruit based drinks that refresh and cool. The simplest ‘shrub’ is Apple Cider vinegar (with mother) diluted with water. Ugh! I hear you say, drinking vinegar???? Trust me, once you get over the initial strangeness, this concoction is remarkably thirst quenching and enlivening. Plus there are health benefits such as a boost for the immune system while helping to combat thrush and candida, all of which are more likely to occur during the oppressive heat. 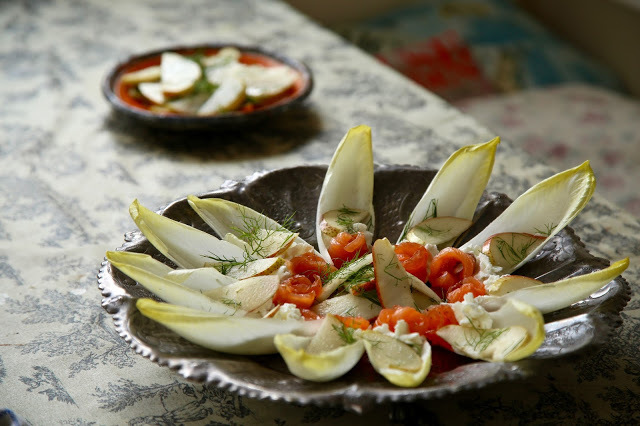 Quick pickled fruit livens up canapés, salads and can be used as a side dish. Here I give you a recipe for Quick Pickled Pears but it works just as well with apples. I’ve also used the pickled pear slices as a garnish for a stylish canapé but it also goes well with cheese and cheesy dishes. I used the pink tinged South African Forelle pears for this recipe. South Africa has opposite seasons to the UK, so when our pears and apples are out of season, we can eat shipped produce from there. Mix all the ingredients together and leave in the fridge for an hour. I’m not quite sure what to call this vegetable. In France they call this crisp vegetable with a slightly bitter flavour, endives while in Britain, traditionally we call them chicory. Today you’ll find them under both names. They are grown ‘forced’ underground so that that the leaves are pale. Cut the end from the endive and carefully separate the larger leaves into individual leaves or ‘boats’. 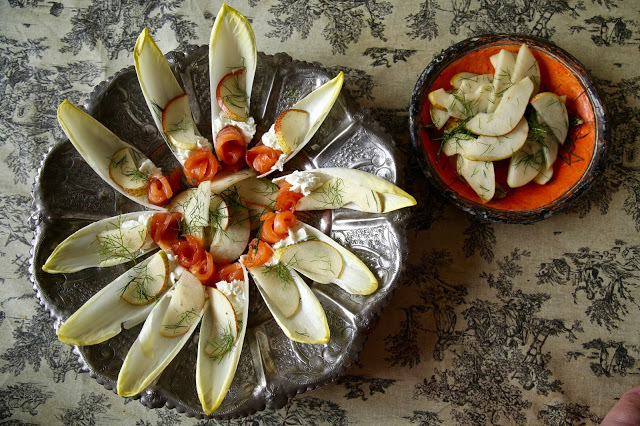 Put a heaped teaspoon (or pipe a few centimetres with a piping bag, ) of goat’s cheese in the endive. 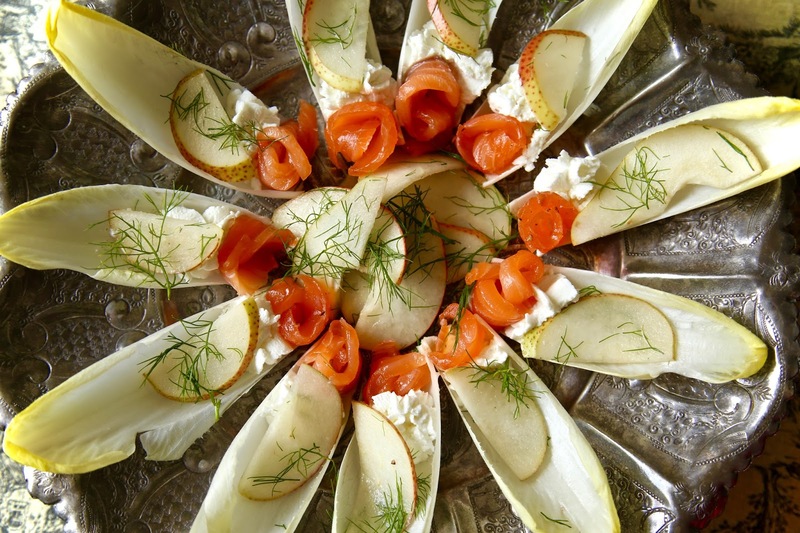 Take the thin strips of smoked salmon and roll them up, place with the ‘boats’, next to the goats cheese. Then place a slice or two of the pickled pear.